The Slumber Sleep Extreme EX50 memory foam mattress is manufactured to the highest of standards using only the most premium of foams. Its high quality structure gives extra support for the neck and back and a combination of 2 inches of memory foam and 6 inches of reflex foam offers real durability and comfort. Circulatory Problems – The weight of the body is absorbed by the Memory Foam allowing the blood to circulate efficiently throughout the body preventing bed sores, swollen calves and feet. 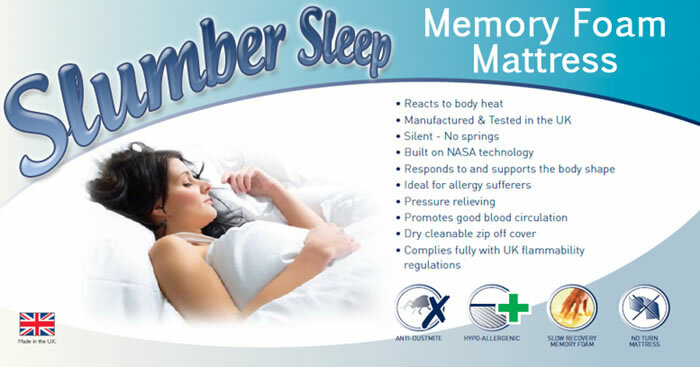 Allergies – Our Memory Foam is dust-mite resistant and anti-microbial, ideal for asthma sufferers. Mattress Thickness (approximate): 8 inches (including 50mm Memory Foam and 150mm Reflex Foam).